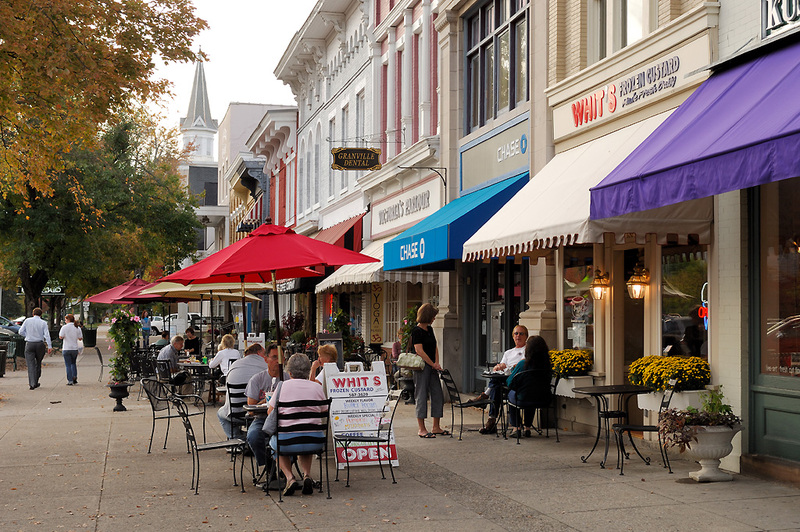 Granville is a quaint, New England-style community located in Licking County (east central Ohio) along the western edge of the Appalachian Plateau. It is the home of Denison University. The Village has a permanent population of 3500 and a total population of 5600 when the college students are in session. Located at the end of Bryn Du Drive in Granville is “Alligator” mound, one of two great animal effigy mounds built by Ohio’s prehistoric people. It sits on top of a bluff overlooking the Raccoon Creek valley and is on the National Register of Historic Places. For more than 100 years, the historic Bryn Du Mansion, located at 537 Jones Road, has dominated the landscape of a 52-acre estate on the east side of Granville. With 52 gated-acres, 32 acres of level front lawn, and a 7,200 square foot Field House, the entire Bryn Du estate is utilized for community activities, special events, private events, or sport and athletic competitions. On Sunday afternoons during the summer months, polo is played on the Great Lawn at Bryn Du. In 1812, Orrin Granger, a pioneer from Granville, Massachusetts, built “The Tavern” on land that was purchased in 1806. That tavern, now known as “The Buxton Inn“, has been operated continuously since that date in 1812. It is Ohio’s oldest continuously operated Inn, still located in its original building. The Inn is listed on the National Register of Historic Places. The Inn operated as Granville’s first post office and as a stagecoach stop on the line between Columbus and Newark. Founded in 1929 by Beman and Bertie Dawes, The Dawes Arboretum now covers nearly 1,800 acres and includes eight miles of hiking trails and a four-mile Auto Tour. An open-air wagon is available for groups up to 60 people. This is a guided tour that takes you by some of the prime collection and garden areas. There are more than 15,000 living plants on The Arboretum’s grounds, and most are hardy in central Ohio. The Arboretum’s native plant conservation efforts include conserving plants in their native habitats, taking inventory of native plant communities, and restoring and recreating Ohio native ecosystems.